We some times need to convert one file format to another, that time we usually look software for conversion. It’s good to use software for conversion when you need to convert big files, but not worth to download for small file conversion. Moreover, not all software supports all file formats to convert files. For some reasons online file conversion useful compared to desktop application. I have seen many online file conversion site but most site supports only one or few types of file format conversion. Today I found one site called online-convert.com which supports many types of file conversion from one format to another. We can access those converters at one place, that too free of cost. Each converter supports almost all file format/extension in it. 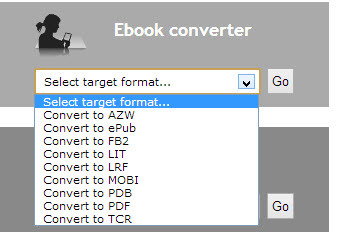 For example, in Ebook converter you can convert a file to AZW, ePub, FB2, LIT, LRF, MOBI, PDB, PDF, TCR formats. All we need to do is, just select the target format to convert the file and upload document or you can choose document from dropbox. Once the file was converted, it will automatically downloaded to your PC or you can upload the converted file to your cloud storage like dropbox or Google drive within the site itself. If you don’t wish to keep your file on their server, then you can delete those file immediately with the given delete link after conversion or after 24 hours it will automatically delete your file from their server. I have shown here only one converter. In their website they have many such converters are available. You can get all file converters in one place for free. Moreover it is easier to remember their domain name so that next time you can directly visit that site whenever you need to convert file. You don’t need to signup to their service to start using it or to download the converted file. I recommend you to try this site once if you need convert any files online. If you need to convert small files to another format, then use online converter instead of downloading software. This website is nice and offers various file format conversion at one place. You can directly visit this site instead of searching on Google when you need to convert any files. Because it offers almost all file format conversion in it and that to for free.